UNRWA has evolved from a temporary relief organization into the guardian of Palestinian statelessness. Since Israel's inception in 1948, the Arab-Palestinians mark Nakba Day. Nakba, the Arabic term for catastrophe, represents much more than just the physical creation of the modern State of Israel in 1948, which Palestinians decree as the cataclysmic disaster. It is also the Palestinian process of refusing to accept the fact that a sovereign Jewish state could even be allowed to come into being. Over the years, one of the greatest ironies is that Arab members of Knesset have repeatedly proposed establishing an official Nakba Day. Although the Knesset's Ministerial Committee on Legislative Affairs eventually banned these proposals, they indicate how ingrained 1948 is in the Arab psyche. To the Knesset's credit, there was an understanding that marking the Nakba is harmful and propagates the notion that Israel's birth was illegitimate. But what is the Nakba all about? On the one hand, the very idea that an Arab-Israeli MK could propose Nakba be celebrated as a national holiday highlights the extent and openness of Israeli society; even ludicrous idea can be raised in its parliament. On the other, such a proposal would require Israeli society to forget what Zionism is all about. Nakba represents the Palestinians' refusal to accept the existence of a sovereign Jewish state. Moreover, the Nakba's vitality is embedded in the existence of Arab-Palestinian refugees who serve as a permanent reminder of the original sin of 1948. Nakba is also what has allowed Arab countries to treat their own brethren as bargaining chips rather than human beings whose suffering and deprivation they could have alleviated. Let's take Lebanon. Arab-Palestinians amount to approximately 450,000 refugees registered in 12 camps run by UNRWA, where Lebanese authorities have no jurisdiction. The Palestinians have been caught in a perfect storm, where they can rationalize and blame their condition on Lebanon and Israel in tandem, yet Israel is guiltier given its sole responsibility for the Nakba. While Palestinians are prohibited from working in most professions and from owning property, it is never seen as an outgrowth of Lebanese policy or Arab politics at large. Claudio Cordone, UNRWA's country director, of course claims that Palestinians in Lebanon feel trapped in a political limbo and see an "almost total lack of meaningful political prospects of a solution" to their perceived displacement from "Palestine." Sheikh Mohammad Muwad, a Palestinian imam in Sidon, was recently quoted as saying, "[T]hey starve us, so we go back to Palestine. They deprive us, so that we go back to Palestine. Well, go ahead, send us back to Palestine! Let us go to the border, and we will march back into Palestine, no matter how many martyrs we must give." It's a statement that is analogous to the ones heard for decades, for example in 1949 when UN's Economic Survey Mission reported on a visit to Gaza in 1949: "In one of the camps, the refugees staged quite a demonstration. A large sign had been printed in English on which were the following, numbered as indicated: 1. Send us back home. 2. Compensate us. 3. Maintain us until we are refreshed. Just what they had in mind by 'refreshed' I leave to your imagination." Syrian-Palestinians who fled that civil war have protested outside UNRWA's offices in Lebanon, asking for help. But the double standard is critical to Palestinian identity; the Nakba narrative mandates the creation of a Palestinian state only in Israel, while everything beyond those borders should be a constant reminder that there is no option for resolution outside of "Palestine." UNRWA's success has been in transforming itself into the guardian of the refugees' isolation. 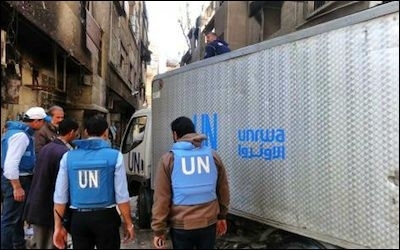 UNRWA's success has been in transforming itself into the guardian of the refugees' isolation, preserving the uniqueness of the Palestinian refugees' identity as an entity that cannot be assimilated into any Arab country, but only into what is perceived as Palestine. This dependency prevents the refugees from directly getting involved in local politics, leaving UNRWA as their only voice in the "Arab wilderness." In 2007, shortly after the Hamas takeover of Gaza, Ahmed Jammal, a father of five from Gaza, exclaimed inside an aid center in Gaza City that "we now have only God and then UNRWA." This perceived theological bond has enshrined the fact the no Palestinian leader will ever get the mandate to give up the "right" of return or UNRWA's role, and this is the Nakba at its core. Since 2017 is the 50th anniversary of the Six-Day War—a war for Israel's survival—there has been significant growth in commemorations reminding the world of Palestinian statelessness and refugeeness. It is a reminder that anniversaries should celebrate growth and not paralysis.